The yellow one is 2 1/2" x 2 1/2" and the brown one is 2 1/2" x 3 1/2".I am using cold press watercolor paper and for the small ones it is a bit hard to work with due to the thickness.. however I did manage to get 25 pages in there. Room for many little thoughts . Impressive mini books! Given the thickness of the paper, you were really masterful to get 25 pages. Nicely done. Love your little journals. They are wonderful. 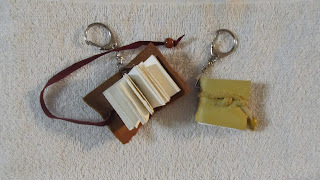 Wonderful wee books - I made one once and swore I'd never try that again. Kudos to you for doing so many! OMG! These are so adorable. I would think they would be hard to make. So tiny, oh my!!!!! Yes bambi eats my garden but was so regal I let him stay for awhile. Noticed the day-lilies had been de-flowered. LOL I did caligraphy many moons ago and am a bit rusty with it. My goodness, what great art, you must have eyesight to match. miniature+journal=awesome! I love both miniatures and journals! So cool, Maggie!